Ten years from now? I plan to be gone. On July 4th, a woman was arrested for climbing the Statue of Liberty. Her name is Therese Patricia Okoumou. Why did she climb the Statue on Independence Day? To protest Trump in particular, white “supremacy” in general, and call for the abolition of the ICE. An activist group called Rise and Resist said on Facebook that Okoumou was part of a protest at the base of the statue against immigration policy. The protesters unfurled a banner that read “Abolish ICE,” the acronym for the U.S. Immigration and Customs Enforcement agency. Created in 2003, the agency has become a focus of criticism over U.S. President Donald Trump’s policy of “zero tolerance” for illegal immigration. That chick is an immigrant from Congo, of all places. She wants ICE abolished, eh? ICE is what's keeping her savage countrymen out of here. The evil in that country didn't just start a couple of years ago. But Okoumou has been in the USA for 24 years, so, perhaps she has forgotten. Maybe she should have her memory refreshed. 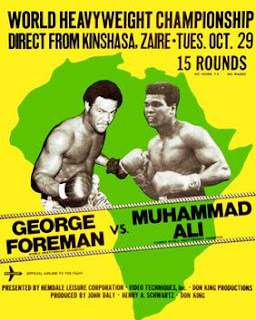 Back when Congo was called Zaire, and after the late boxing legend Muhammad Ali returned from his triumphant heavyweight championship bout in Kinshasa against George Foreman, aka the Rumble in the Jungle, Ali was asked what he thought of Africa. Ali responded thus: “Thank God my granddaddy got on that boat!” Of course Ali was referring to the slave ships. That was a typical slice of honesty from The Greatest. There's a deleted scene from the movie Tears of the Sun – a movie about a bloody civil war in Nigeria – during which a Nigerian tells a black American SEAL team member that he looks Nigerian and that, were it not for the Trans-Atlantic slave trade, the SEAL would have been born and raised in Nigeria “with us.” The SEAL has no response to this and it's easy to see why the scene was deleted because the only logical response is, “thank God for slavery.” Hollywood writers aren't brave. Then, last week, there was reality in Nigeria. In what the Christian Association of Nigeria is calling a "pure genocide," 238 more Christians were killed and churches desecrated by Muslims last week in the west African nation. This brings the death toll of Christians to more than 6,000 since the start of 2018. According to a joint statement by the Christian Association, an umbrella group of various Christian denominations, "There is no doubt that the sole purpose of these attacks is aimed at ethnic cleansing, land grabbing and forceful ejection of the Christian natives from their ancestral land and heritage." The statement condemned the recent attacks, "where over 200 persons were brutally killed and our churches destroyed without any intervention from security agencies in spite of several distress calls made to them." The statement adds that the majority of those 6,000 Christians massacred this year were "mostly children, women and the aged... What is happening in ... Nigeria is pure genocide and must be stopped immediately." The Haitian government suspended a fuel price hike Saturday after widespread violence broke out across the capital and in the northern city of Cap-Haitien. Prime Minister Jack Guy Lafontant had originally said the country needed to raise prices to balance the budget and gave no indication he would back down. But his administration bowed to pressure after demonstrators took to the streets in protest. A journalist from The Associated Press reported seeing several hundred people on Saturday attack a Best Western Premiere hotel in Petion-Ville, one of the capital’s wealthiest neighborhoods. Guests were forced to remain inside as rocks were hurled through windows around 10 a.m. local time. Four years ago, I speculated that Africa and those of black African descent, who are not followers of Jesus the Christ might be under a 4,000-year-old curse. And yesterday, the essay got a lot of new publicity, along with some criticism, because whaah slavery and because other people have done a lot of bad things over the centuries. Well, hey, they are subject to curses too, but not in the same ones we are. And, as I said in 2014, how can we tell the difference between cursed and not-cursed in when it comes to places like Congo and Haiti? I'm just glad I live here -- yes, even in California -- and not in those places. Safe ... for now. Every Tuesday and Saturday, I blog at the award-winning DaTechGuyBlog. Latest posts: Patrons, Serfs, and Turf.